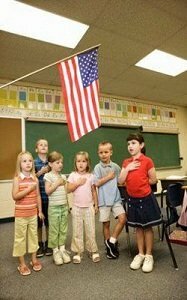 The Pledge of Allegiance is a daily ceremony that is held in every school. It means loyalty to the USA flag. Every morning children hear these gorgeous words, stand up, recite them or remain silent. However, not everybody feels true respect to the flag and not everybody realizes dignity of the occasion. For most of kids the Pledge is just a tradition, an everyday routine and a boring duty. However, later they will think about the importance of democracy and justice in the USA. They will feel proud of their country and the spirit of freedom that predominates in every city or town of this huge country. Moreover, they will feel united, as a team of associates that aims at perfection; one nation of free and happy people. The Pledge of Allegiance was composed in 1882 by Francis Bellamy. The author was not only a minister, but also a Baptist. He grew up in the family of deeply religious Baptist Christians. Thus the Pledge stirs up many disputes. Some people think that it is acceptable only for Christians. However, the USA is a multi-religious country where only about 88% of the population is Christian. This is why in 1942 the phrase “under God” was deleted and declared as illegal. Nevertheless, in 1954 it was added again. Earlier, in 1923 the words “my flag” were alternated to the phrase “The Flag of the USA”. The reason was that it could be attributed to the flags of other countries by foreign people or migrants. Every letter in the Pledge is very important and disputes about it could take several years. it still gives kids some time to think about their love to the country. if students confront the government or don’t like the US army, they can express this attitude to the Flag. Some people, including parents of modern pupils, consider that daily and obligatory recitation of the Pledge of Allegiance contradicts the very idea of freedom and democracy. As for me, I think that this everyday tradition is right and necessary. However, if it could be any multi-formity and imaginative touches, it would be wonderful and it would persuade many people who are just tired of the routine.